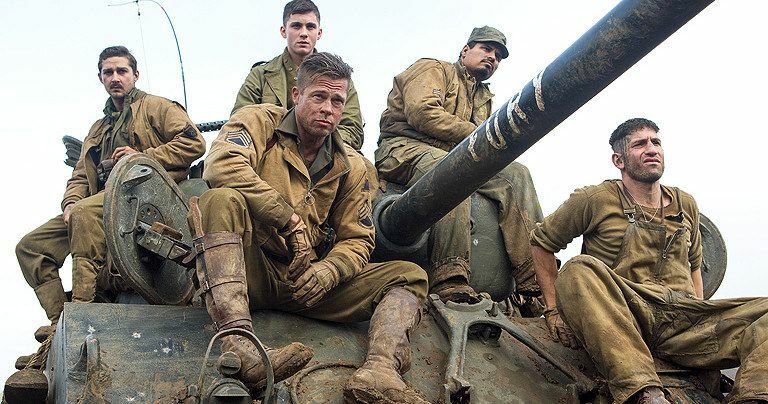 Back in September, Fury director David Ayer released the first photo of Brad Pitt as Wardaddy on the set of this World War II movie, but today we have the first two official images, featuring the actor alongside co-stars Shia LaBeouf, Logan Lerman, Michael Peña and Jon Bernthal. Take a look, then read on for more details from director David Ayer. Director David Ayer reveals that Brad Pitt is playing a character he doesn't often get a chance to portray. "He's playing this badass, hard, tough, intense guy. It's a different kind of role for him." The project is based on the true story of a five-man Sherman tank crew on a deadly mission behind enemy lines in 1945. The filmmaker reveals that he wanted to make the tank movie to end all tank movies. "I set out to make the ultimate tank movie." While Shia LaBeouf has made headlines recently for plagiarism and retiring from public life, the director revealed the actor was a pleasure to work with on the set. Aside from the big name stars, the film also features an appearance by an authentic German Tiger tank, which was on loan from a museum. "I couldn't tell you how much insurance this thing had on it - it was crazy. It actually ended up performing really well. It's like the tank was happy to get out of the barn and run around. These tanks like to run hard. That's what they're built for."